A tabloid, which still does tough local stories, the Daily News gave in to the “1.3 million ‘likes’ and 172,563 shares on Facebook.” And why not? In a world where clicks drive ad revenue and social media increasingly determine news content, a picture that, according to one Facebook user, affirms “there is still hope in humanity” is an editor’s godsend. I often take the Q-train, where the photo was snapped. And when I do, riders of all ethnic stripes sometimes nod off against my shoulder. Call me an embittered New Yorker, but in a speeding, raving babel of the homeless and the insane, the beggars and musicians, the break dancers and doomsday prophets, I never make much of it. And after some 20 years of using the city’s transit system, I found that pointing a camera at complete strangers is usually merited only by something truly bizarre, even by New York standards. 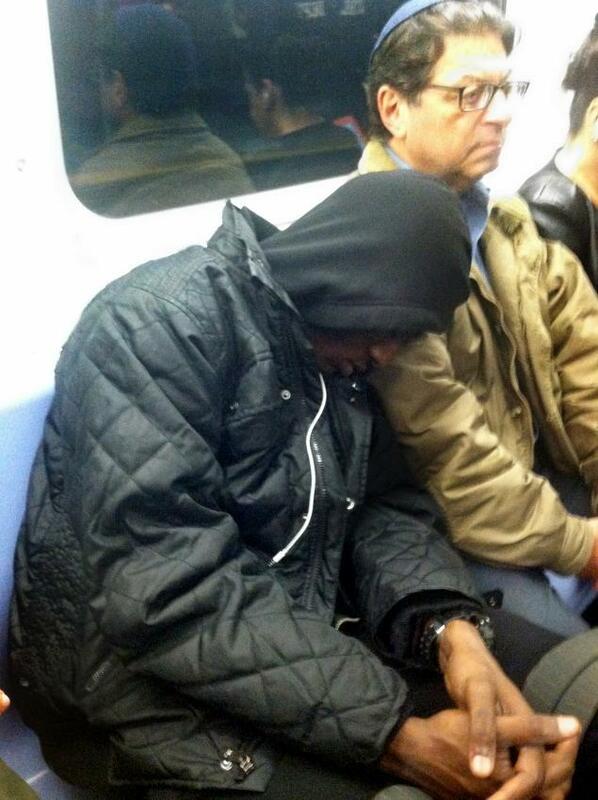 As any straphanger will attest, the scene of a black man sleeping on the shoulder of an orthodox Jew—or vice versa—is not uncanny. What’s curious is a rider’s voyeuristic impulse to get it on camera. It is an act that exposes a way of seeing—an idyllic display of our city as a melting pot—a city that, as it turns out, exists only in the viral delirium of Facebook, Twitter and Reddit. “I think the fiction of New York history and New Yorkers’ self-perceptions, is that they were the most tolerant people in the world,” historian and MIT professor Craig Steven Wilder once wrote. Sensationalized out of proportion, the snapshot reveals Gotham as a place in which a Jewish man’s tolerance of a black man is the aesthetic equivalent of an albino tiger roaming in the wild. It posits that something so extraordinary is happening, so special and fleeting, that it must be seized and shared and preserved. This unyielding insistence on wonder at anything that resembles cross-cultural empathy betrays our pedestrian judgments of both blacks and Jews and our assumptions about the two groups’ mutual aversion. Indeed, New York is the most diverse city. We live close to each other and witness keenly our disparate lives. But we are not a melting pot. Not if this photo tickles us into a collective “aw.” Not as long as the recent rash of “knockout”—in which unsuspecting New Yorkers are randomly targeted and struck in the head—was served up as an anti-Semitic ploy before suspects were even in custody. Instead it shows that we fetishize diversity. We “like” it and Tweet it and blog it. But in the world of living, breathing human beings we only embrace it when someone is asleep. And the Reddit user who posted the image before it went viral? He told the Daily News that “it really wasn’t about the ethnicity of the people,” but kept his own identity private. This photograph is then our cover. It affords us the privilege of speaking to New York City’s diversity in all manner of exaltation; to wear it as a badge of honor; to praise it as if it were a sculpture or a painting. But in the end, it’s just a sneaky cell phone picture—a pixelated image that coheres on a screen, but, once magnified, reveals nothing more than scattering dots of different colors. What will this muckraking project expose, I wonder? What’s to be gained by printing the identity of a man surreptitiously photographed while sleeping? What new knowledge can be extracted from his telling? His name? His job? His favorite color? Or maybe he’ll tell us what he dreamed of—a city perhaps—one in which he wouldn’t have to work himself so ragged as to slump over a stranger on the train. Steven Volynets is a writer whose work has appeared on ABC News, U.S. News & World Report and The Houston Chronicle. He blogs at http://stevenvolynets.blogspot.com/.